The big winners in the 4th annual Africa Fashion Awards were announced at a glittering ceremony at Melrose Arch, Johannesburg on October 28, concluding over 20 shows in the inaugural Mercedes-Benz Fashion Week Africa. Highly-acclaimed Nigerian designer, Ituen Basi, won the Designer of the Year: Africa award while Ghanaian-born, American-based designer, Mimi Plange was announced Designer of the Year: International. 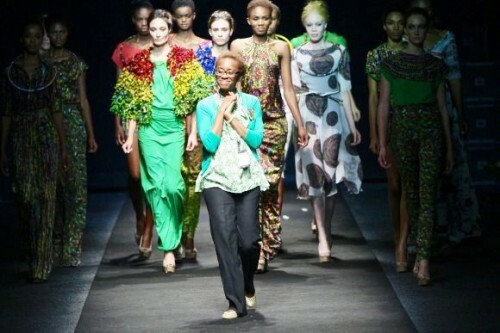 As part of the prize, both designers will feature in the international Mercedes-Benz Fashion Weeks in 2013 – showing Africa at its fashionable best to the rest of the world. Mozambique designer, Taibo Bacar, who was recently crowned “Best Designer” at Mozambique Fashion Week, won the Emerging Designer of the Year: Africa award while Cote D’Ivoire-born and Paris-based, Laurence Airline won Emerging Designer of the Year: International. The Accessories Designer of the Year award went to the inventive designer, Doreen Mashika from Zanzibar and South African Thula Sindi was crowned the SA Tourism Designer of the Year. The dazzling closing event of Mercedes-Benz Fashion Week Africa 2012 included performances by renowned singers Lira, Lindiwe Suttle, Naima McLean, Nandi, Chiano Sky, Mi Casa and Rutendo Denise & Theresa Muteta. The prestigious Africa Fashion Awards acknowledges design talent from the continent and African diaspora. Nomination criteria for designers and industry influencers included the notion that their work represents a strong emergence of a global African signature along with measuring the potential global reach of their brand. “The Africa Fashion Awards rewards African fashion excellence using global industry criteria and recognises the exceptional talent of African industry members world-wide,” says African Fashion International (AFI) Executive Chairperson Dr Precious Moloi-Motsepe. After a ten-month journey in the AFI Fastrack mentorship programme, the AFI Young Designer of the Year award went to Capetonian Kim Gush. Fashion-forward icons were also acknowledged with the Male Style Icon of the Year being awarded to Khaya Dludla and the Female Style Icon of the Year to Ethophian model, designer and actress, Liya Kebede. The Model of the Year award went to South African supermodel, Candice Swanepoel. Acknowledging the world’s most-wanted behind-the-scenes creative stylists, Cape Town based make-up artist-to-the-stars, Lesley Whitby, won the award for Outstanding Contribution to Make-up Direction and the Outstanding Contribution to Hair Direction award went to the globally renowned celebrity stylist, Kevin Epstein who is also based in Cape Town. The esteemed Jackie Burger, Editor of Elle magazine, South Africa, was awarded the Outstanding Contribution to African Fashion accolade which recognises meaningful change to the industry and the support and nurturing of developing local talent from the continent. This award was shared with photographer Simon Deiner. Outstanding Contribution to Fashion Styling went to Arthur Malan-Murison, Editor of GQ and Creative Director of GQ Style South Africa while Cape Town based, Ross Garret won the award for Outstanding Contribution to Fashion Photography. The Fashion Communicator of the Year award went to London based journalist, stylist, and author of New African Fashion, Helen Jennings. Nominations for the various award categories were made by the public earlier this year and final judging took place during Mercedes-Benz Africa Fashion Week Africa. The judging panel consisted of local and international fashion leaders including Felicity Spies of Egality, Robyn Cooke of Style Guide Cape Town, Bryan Ramkilawan, CEO of Cape Town Fashion Council, Elle magazine’s Fashion Director, Poppy Evans and internationally-acclaimed fashion journalist and Vanity Fair Editor-at-Large, Michael Roberts. The results of the awards were independently audited by Pricewater House Cooper Incorporated. With more than 20 shows over four days, Mercedes-Benz Fashion Week Africa presented designers from South Africa, Cote D’Ivoire, Mozambique, Cameroon, Rwanda, Angola, DRC, Trinidad, Nigeria and Ghana as well as designers from the African diaspora – all of whom were chosen for their standards of global relevance and commercial viability along with a distinctive design that exemplifies African creativity.